My name is Chris Dams and I am a go-player from the Netherlands but I now live in Milan. I play on IGS as "chrisd" and am 7k there at the moment. I'm sorry that I do not have much rating improvement to report. This may have something to do with the fact that I hardly played lately. I did not forget go though, I nowadays seem to be more interested in go programming. Here you can read about the basic principles that I use in my program. Here you can read what I have been doing lately to improve my program. I like to play at the 3-4 point in the opening. Usually I play my first two moves on two 3-4 points. This is not very well motivated. The first book I read was "basic techniques", which I think is really bad but that is another story, and there the usual opening moves were shown and something was said about them. I liked what was said about the 3-4 point best, so I started playing that and never tried much else. Oh well, I did try the 4-4 for a short while, but came to the conclusion that it really does not matter that much. Encloseres are a bit less urgent and extensions a bit better, but go still remains go. Besides, everybody seems to be playing 4-4 already, so why immitate them? Doesn't this give a lot of influence to the opponent? Yes, possibly, and it is important to keep that under control. Just play one influence-orientated move (4th line) that is, say, about six points away from the opponents stones that give him much influence and observe that his influence is now already limited. An alternative option is a wedge on the third line. 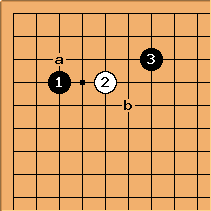 Next, wait a few moves while building some territory yourself and then invade the sphere of influence of the opponent, if still necessary. Works well enough for me and applying this strategy cured me of my fears for infuence. Really seriously, if neither you nor your opponent played obvious blunders in the opening, the situation should me more or less equal, shouldn't it? So, no reason for panic. Don't start a pushing battle that gives more territory to the oppenent than to yourself. Watch out for double threats. Fuseki is less important than you think, but learn about it anyway. 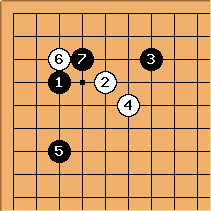 If you forget to look at a group for ten moves, it is dead. Review your games and make every error ten times. Don't review your games and make every error a thousand times. 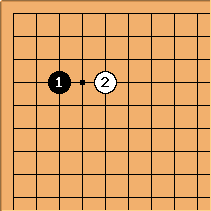 If the opponent plays a lone stone on the fifth row, play one under it quite soon. 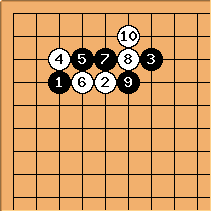 Play a 3,4-stone such that an enclosure faces the side where there is more influence. 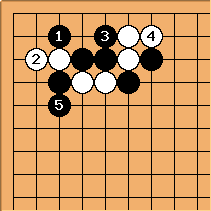 Black plays a if he can use some influence facing downwards. 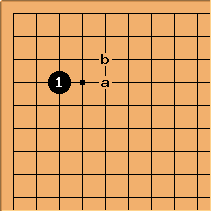 Otherwise a.
a if White can use influence facing downwards. b otherwise. is best according to Kogo.